The word ‘Bindi’ essentially comes from the Sanskrit word Bindu, which means a tiny drop or a dot. Bindi is a dot which is worn as a decoration between the eyebrows or in the center of the forehead. It is red in color, but other color variations are also available. It is hugely popular in South Asia and South-East Asia. The bindi is worn at the center of the forehead and between the eyebrows. That is the place known for the hidden wisdom. It is also the place for the third eye. It is believed that the bindi can hold on to strength and energy of the wearer. There are various beliefs and myths surrounding the red colored bindi. Some say red represents strength or power while others believe that the color red symbolizes love and so on. It also symbolizes the marital status of a woman. It symbolizes power and energy. It is believed to protect a woman and her husband. It can be worn by women of different religion. However, according to the Islamic religion, wearing a bindi is not permitted. It resembles Hindu tradition or symbols. Bindi is also worn as a fashion symbol. Instead of using the traditional red dot, different varieties of dots or forms are used as bindi. As bindi is being worn by different people across the globe, it has various names. In India, it has 12 different names. The Bengalis calls it Tip, Phot in Assamese, Chandlo in Gujarati, Tilo in Konkani, Tilak in Hindi, kunkuma in Kannada, Kunkoo in Marathi, Bindi in Punjabi, Pottu in Tamil and Malayalam, Bottu in Telugu, and the list continues. In Nepal the bindi is known as Tika. Now, we have come to know what a bindi is and the significance of why it is worn. 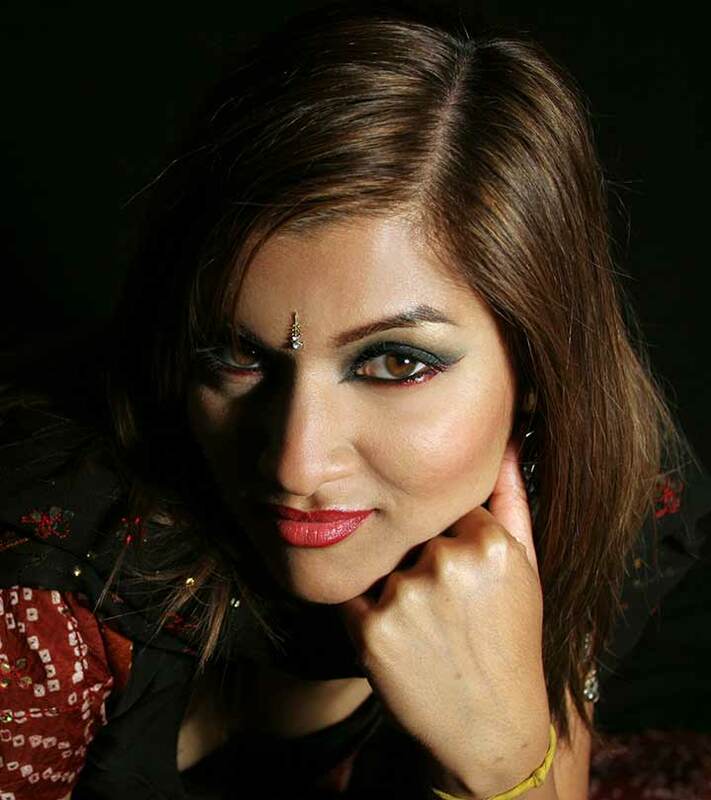 The popular tradition and history behind the bindi have given it a significant importance. It is now considered as an important accessory. A single bindi can enhance the beauty of a person as well as the outfit one is wearing. It has gained so much popularity that designers are creating new designs of bindi. 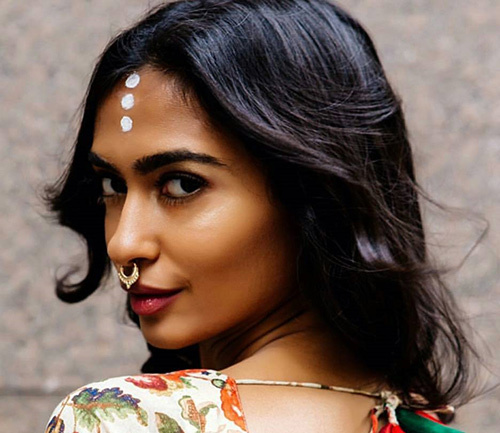 There are hundred different ways to wear a bindi. As it is now worn by people across the world, different styles of sporting bindi have emerged. People are experimenting with the colors, textures, shapes, sizes and raw materials to make lovely bindi designs. The bindi is worn in different shapes and sizes across the world. 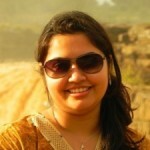 The way and the style to wear a bindi mostly depends upon the region. Out of the hundred or more ways of wearing a bindi, let us now get an insight on the top 19 bindi designs, which are popular and traditional ways of wearing a bindi. 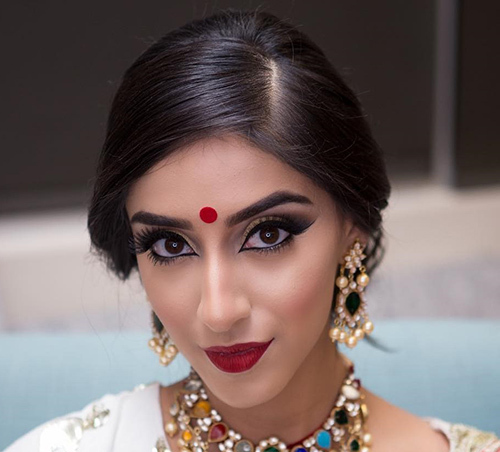 This style or design is the most commonly used way of wearing a bindi. It is worn at the center of the forehead and between the eyebrows. As the name suggests, it is red in color and smaller in size. It can be made by using vermilion. 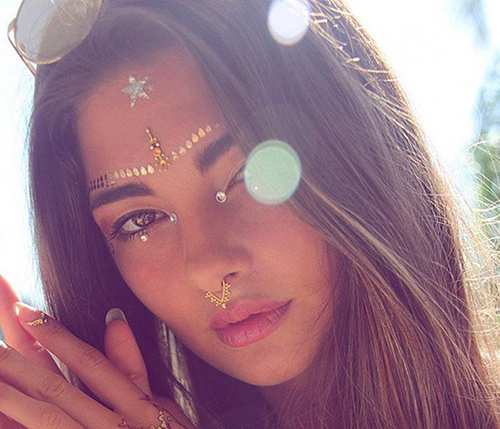 Sticker bindis are commonly used now- a-days. These are also very much used by the married women. 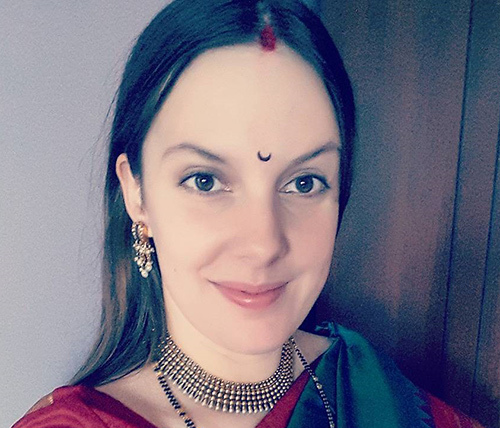 The Tilak or the Tika finds its place in the second position in the top 19 bindi designs. It is worn on the forehead, especially by the men. Tilak or Tika symbolizes good luck. And, it is generally worn when men go out for doing some important work so that they succeed in their mission. In India, Tilak finds a prominent place in the groom’s get up. Going back to history, Tilak was used prominently when the kings went for war. This bindi is worn in the center, but in a long line. This bindi looks good with people having wide forehead and oval face. The long line helps in adding length to your face. This long line can be drawn using a black liner or a black Kajal pencil. It can also be decorated with glitters. This is undoubtedly the easiest and the cutest design for bindi. It is the easiest way to wear. 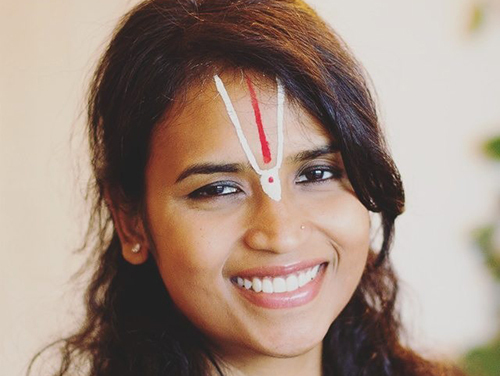 Like all other bindis, it is worn in the center of the forehead as a small dot. This black dot can be made using a black liner or a Kajal. This design is worn especially in South India. It looks good with traditional South Indian dresses. It adorns the forehead of the young South Indian girls. As the name suggests, this bindi originated in the state of Maharashtra, in India. It is worn in the center of the forehead. Its shape represents an upside down, semi-curved moon. It is popular among the Marathi women, especially those living in the coastal areas. This bindi design is made in floral patterns. This represents the shapes of the flowers and leaves. This bindi design can be made either by stones or by color. This bindi is worn on the upper part of the forehead. It can be both simple or jeweled, and can be matched with your traditional attire. This bindi is a good option if you want to sport a mang tika but don’t have one. This bindi design is created by using stones of different colors. The expensive variant of this bindi design uses Swarovski. It is undoubtedly a sticker bindi. It goes very well with the embroidered dresses. The Paisley design originated in Persia. This design resembles a vegetable in a droplet form. Hence, the bindi is also in a droplet form of longer shape. As the name suggests, this bindi design is made by using two to three bindis. 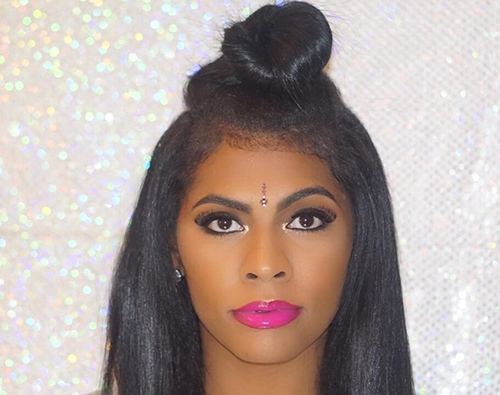 The bindis are placed in such a way that it looks like a layer. This bindi design is very simple to make yet is very stylish. The layers can also be made using bindis of different colors. These bindi designs are unique designs worn by the brides on their wedding day. They are normally stone and glitter studded. 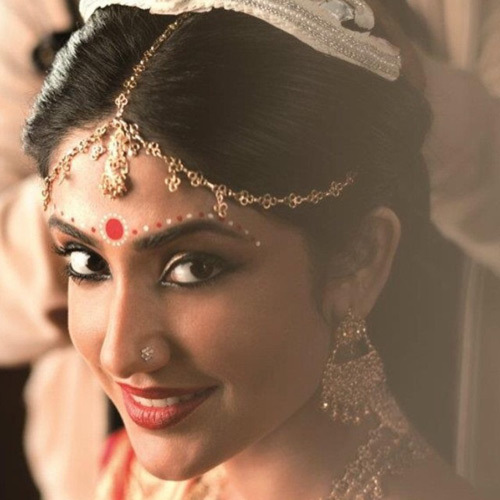 These bindis complement the outfit worn by the brides. This bindi design is inspired by contemporary styling. It is getting popular now-a-days as television personalities are wearing them. They are a mixture of layered and stone bindi. These designs are generally elongated. It is the most common bindi design found in India. It is a tradition for married woman in India to put vermillion in the forehead. They put in the form of bindi. It can be small or big in shape. 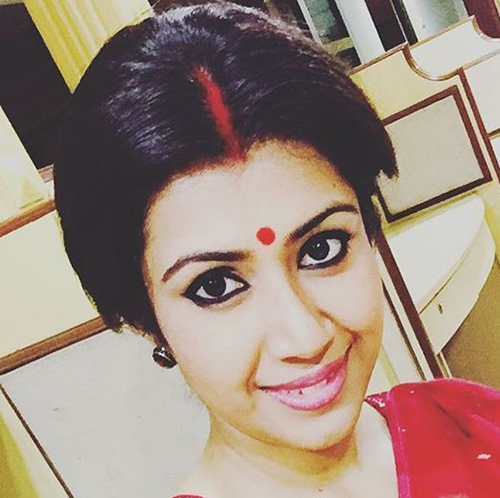 Sometimes, the color yellow is also used with this red bindi. The color yellow comes from turmeric. This combination of red and yellow symbolizes goodwill and good fortune. It is applied to women when they leave for some work. So, that they have good luck and success. It is the cheapest design of bindi available. These are also called Designer Bindi. These bindi designs come in various shapes and colors. They can be long and small in size. These bindis are decorated with stones, pearls, beads and diamonds. These bindis are costly as lot of stones and glitters are used. It is another common bindi design which is becoming popular. The bindi design is in the form of a star. It can be decorated with stones, glitters or can be kept simple. This bindi design became popular after television personalities started sporting them. This bindi design is in the form of an arrow which is pointed downwards. This design can be best made using a black liner or black color. The modified design of the arrow bindi can be the anchor shaped bindi. 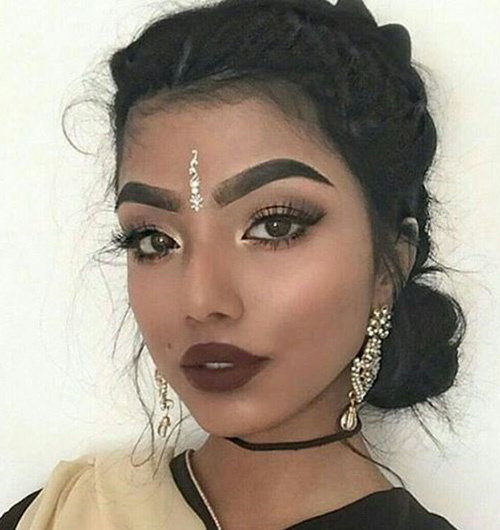 This bindi design is a unique one. It was generally worn by female snake charmers in India. Now, it has become a popular design. It is in the form of curve or waves. These bindi designs are made using small mirrors. These small mirrors are cut into different shapes and then decorated with stones or beads. 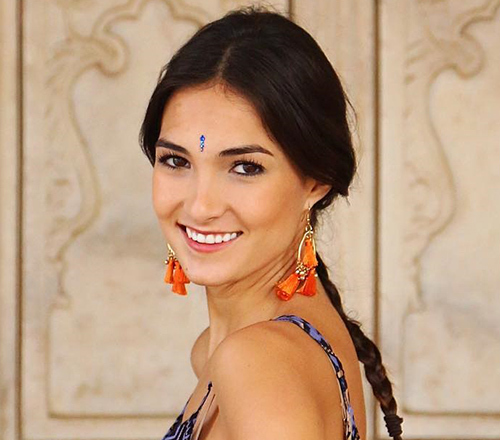 These bindis go very well with casual outfits. This bindi design has taken its shape from the crescent shape of the moon. This design can be worn in different styles. It can be worn sideways, upside down, left or right. 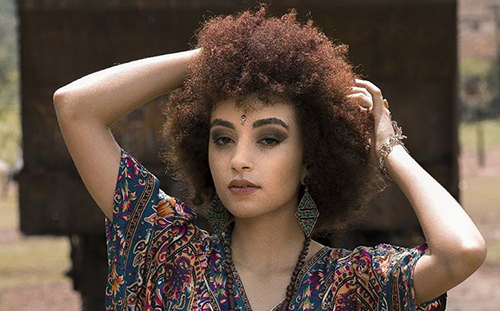 This list contains the top 19 bindi designs worn across the world. However, the list is endless. The bindi is one of the most popular forms of jewelry which can be widely experimented with. The choice of bindi design and style depends on you! There are no rules when it comes to bindis – except the rule of looking beautiful! 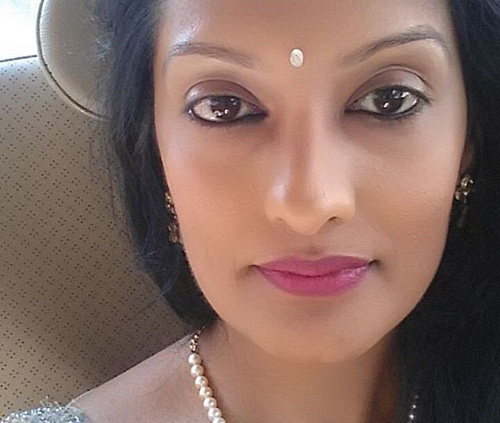 The use of bindi today has seen a significant change. It is now worn by people across the globe. It is no longer limited to age, marital status, religion, and gender. It has now become a prominent fashion statement. So, it now comes in various colors, shapes, and designs. The most convenient bindi available are sticker bindis. These are readymade bindis, which have gum and just need to be stuck to the forehead. The decorations on the bindi are done using beads, stones, glitters, pearls, sequins etc. 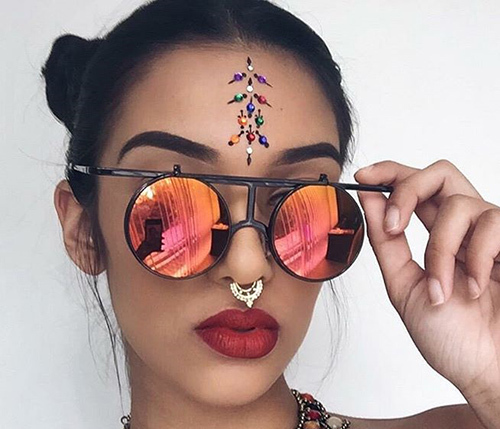 The popularity of bindi is now widespread. It is no longer confined to South Asia. International figures like Selena Gomez, Madonna are using bindi as a fashion statement. 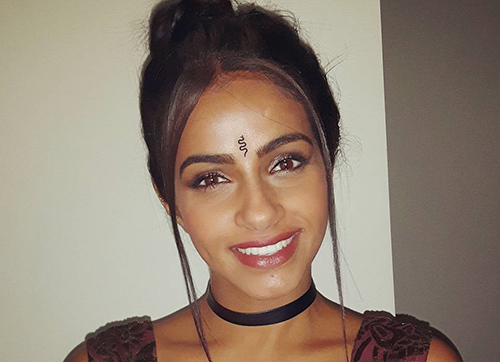 The use of bindi is no longer limited to the forehead. It can now be worn in different ways in different body parts. It can also be worn as a Tattoo. 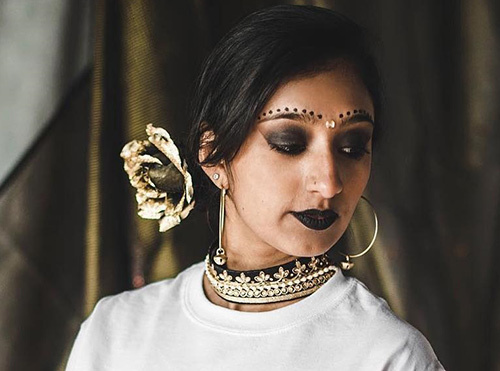 Do you wear bindis? Which one is your favorite? Do share with us in the comments section below. 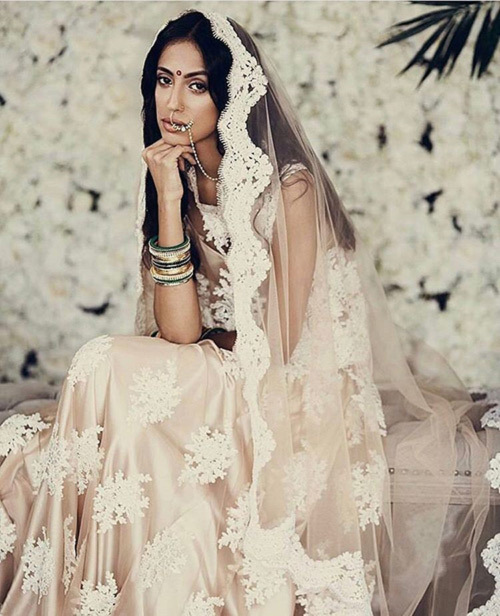 How To Do Wedding Makeup For Brown Eyes? How To Do Makeup For A Wedding Party? How To Apply Foundation Perfectly? 3 Rituals Indian Married Women Follow Every Day, But Don’t Know What They Mean!